2018 Update: Looking for stylish maternity suits? Check out our latest roundup of maternity suits for professional women. Don’t forget to check eBay for maternity blazers and suits, particularly for hits from the past like maternity suits from Theory. Also don’t forget to check Etsy for vintage or new finds that might work, such as Etsy seller Miss Juliette. But I thought it would make a good topic for discussion over here. 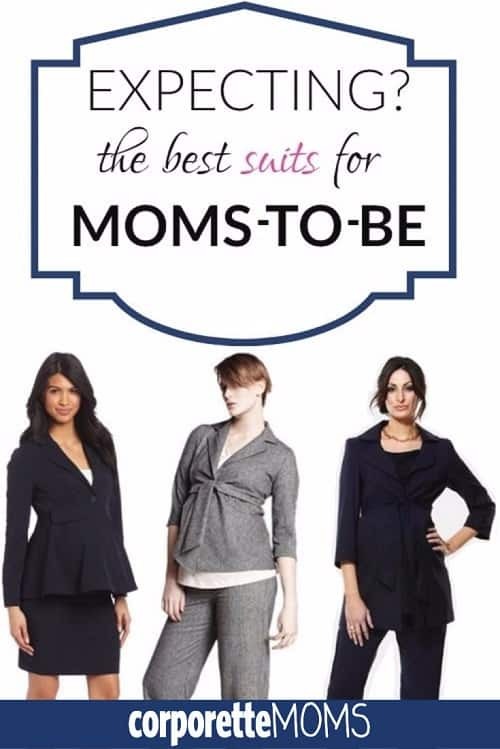 For those of you who needed a suit while pregnant, which brand was your favorite? If you cobbled together a mismatched suit from separates, what are your tips? I bought some maternity blazers in my first pregnancy, but in my second pregnancy (where admittedly I only gained the minimum weight), I found that my regular, non-maternity blazers fit up until week 38 or so. Moms-to-be: Have you found stylish maternity suits you like(d)? If not, what have you been wearing as alternatives? Do you buy maternity blazers or simply wear your jackets unbuttoned? i needed a real suit while i was pregnant for trial and client meetings, and i was enormous when i was pregnant — i could not have dealt with non maternity pants. i sucked it up and bought a theory suit from pea in the pod. yes, it was $700. but it was gorgeous, it was insanely comfortable, and i wore it all the time. the jacket goes with theory non-maternity stretch wool pants so at least that wasnt a total waste. if you already have a theory blazer you can probably hunt down matching maternity pants. pro tip: they dont typically sell their theory pieces on their website but many of the stores carry them. i bought a few rosie pope shirts to go with the suit. altogether i spent an insanity on it but i felt fabulous even though i had gained 50 pounds. i also bought a cheaper suit from figure 8 maternity. (one of the ones that comes in sizes s, m or l. for a suit!) it was ok, but it cost about $150 and looked like a $50 suit quality. i wore those pieces too but they were not adequate for certain client meetings. Similarly, I had a federal jury trial when I was well into my second trimester with my second pregnancy. I bought a couple skirt suits (the federal judge was an older woman who only permitted female attorneys to wear skirt suits and hose…sigh) that were not maternity, but a few sizes larger than my previous size. I also bought a couple grey maternity suit jackets and one black maternity suit jacket, and alternated those with my skirts. I wore maternity tops underneath the unbuttoned jackets. Out of curiosity was this recently? I’ve seen some Theory maternity pants online recentlyish at Shopbop, but I’ve never seen a maternity blazer. Still I’ll bet there are good finds on eBay for that kind of thing. this was about 2 years ago. it was a normal theory blazer that was sold with theory maternity pants. if you already have a theory stretch wool blazer and can find matching pants no need to buy another blazer. i didnt so i just bought the one they were selling at pea in the pod. it was right before trial — i didnt feel like spending much time shopping! Once I really looked pregnant, I just wore a black blazer over whatever dress and (I hope) a “don’t F with me, I’m pregnant and doing the best I can here” look. But also I was mostly in state court, so there was more leeway. I bought JCrew suits 2 sizes too big and had them tailored. I think it looked better than your typical maternity suit. really depends how you carry. I couldn’t wear any non-maternity bottoms — even several sizes too big — after about 15 weeks (low bump very much in the front of my very long torso). And if you usually need to get your pants shortened, get your maternity pants shortened too. I didn’t (because the pants were low quality, it was only for a few months, blah blah blah) and I looked/felt like a wreck with sloppy, dragging pants. Tailoring would have been a really good investment at $15 per pair of pants. This thread makes me happy to be in Canada, where we still wear Robes to court! My firm has maternity robes that get passed around. For non court events I just wore a maternity dress with a non maternity blazer on top. Plus size maternity suits ahahaha there is no such thing. I’ve been wearing maternity dresses with a regular blazer over them and nobody has batted an eye so far. I mostly wore my regular blazers open over stretchy sheath dresses that I somehow zipped my pregnant body into. Add a statement necklace and heels and I felt pretty decent until the end. Or, I would wear maternity dress pants (Motherhood Maternity for the cheapies but boy did they look it after a few months), both maternity and non maternity loose tops, and the same open blazers. I don’t think I would have wanted to close a jacket over my belly even if it were a maternity size! Now 6 mpp I look worse than at 9 months!! Is there a thread on pp work clothes?! I don’t want to look pregnant in maternity tops and dresses with ruching and belts, my regular clothes don’t fit, and sizing up is awkward too because of that pp belly!